Instant Imprints Roswell, GA | Custom T-Shirts, Embroidery, Signs and More! At Instant Imprints Roswell, our customers come to us when they want to be more visible to their customers. We create that visibility five different ways: Branded Apparel (embroidery), Signs & Banners, Promotional Products, Custom T-Shirts and Print Services. Excellent customer service, great prices, convenient location. What else can you ask for? I'm definitely using them again! Are you looking to drive more potential customers your way? Look no further than Instant Imprints in Roswell! Our custom t-shirts, printing services, promotional products, custom banners and branded embroidery items can help you bring your brand to a whole new level of visibility and recognition. Whatever your promotional goals are, our Roswell Image Experts are more than happy to help you make them happen. When you need a world-class service with the personal attention to detail of a local expert, Instant Imprints in Roswell is your source for all things promotional! Many businesses in Georgia know the importance of using quality promotional items in their advertising campaigns. This is because the quality of your branded goods reflects the quality of your brand as a whole, and your promotional items are often the first impression that prospective customers may have of your brand. At Instant Imprints Roswell, we pride ourselves in getting your job done right, the first time, and having it delivered to you on time, in a satisfactory way. We believe in helping those who come to us make a greater impact on the world around them. You probably are familiar with the promotional power a custom t-shirt can have. It’s no accident that virtually every major brand has a custom tee of their own. They’re a surefire way to give your logo legs, and help spread your message across the community of Roswell and beyond. Whether you’re looking to promote an upcoming event, memorialize a past one or show off an upcoming product, our custom tees help bring your brand image to life. In addition, if you want to have an even classier way of customizing, our custom embroidery service lets you decorate virtually any type of garment, however you like. 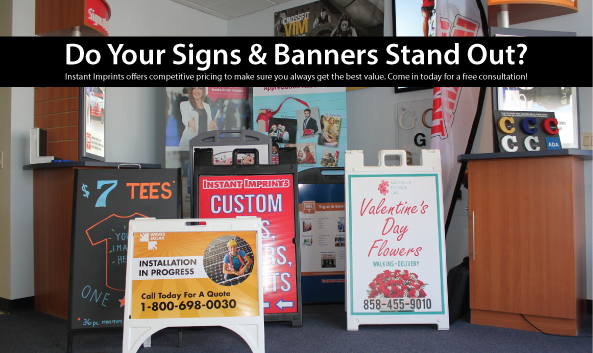 Standing tall with a custom sign or banner is one of the best ways to establish your brand in the local community. Whether you want to invite in folks from the street with a sidewalk sign, or you want to reach motorists with a banner fit for the freeway, Instant Imprints Roswell has all of the tools you need. Our Image Experts are more than happy to help you pick the right combinations of materials, colors and production processes to make your promotional campaign as effective as it can be. When you’re ready to step up your brand visibility, stop in at our showroom on Old Alabama Road, give us a call at (770) 643-0200 or request a quote online today!